Blue-Green Algae; what does it mean for your dog? Let’s kick off with a fun fact; blue-green algae is not in fact algae, but a clumping together of coloured bacteria. These bacteria is known as “cyanobacteria”; their name comes from their colour, “cyano” arising from the Greek for “blue”. These bacteria are capable of photosynthesising, like plants, to make their own food. The bacteria themselves aren’t actually visible; you will only be able to see them when they come together, forming what looks like a blue-green foam, or algae. 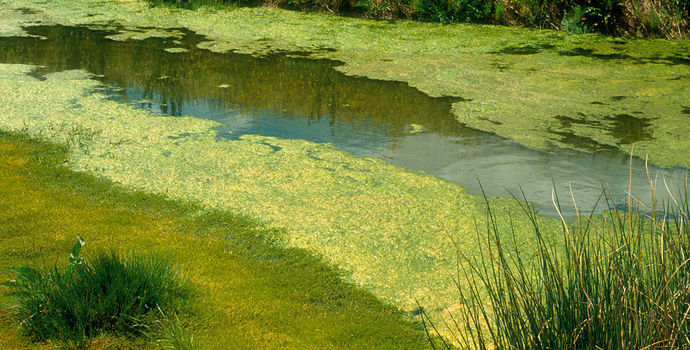 This “algae imposter” typically forms on stagnant bodies of water, such as the edges of ponds or smaller bodies of water. Why are blue-green algae a problem? Why do blue-green algae cause issues for dogs and their loving-owners alike? Many dogs like to lap up some nice stagnant water on walks (for reasons known only to themselves); this often has the bacteria within it. Alternatively, dogs who enjoy a refreshing dip in some affected water may accidentally ingest it, or lick it off themselves post-dip. Tragically, when this happens the bacteria, which are toxic to dogs’ livers, have been reported to cause death in as little as 15 minutes. Yes, 15 minutes - although most dogs linger for several hours before succumbing. While not all blue-green algae are fatal, you will not be able to differentiate between what is toxic and what is not. So, what is the moral of the story? Avoid it all! What should you do if your dog has been affected by blue-green algae? Contact your vet immediately! Unfortunately, there is no current antidote to blue-green algae toxin. However, in a veterinary practice, we can safely induce vomiting (it is not advised that you do this yourself; our vets have access to drugs which can cause vomiting safely and limit the harmful side-effects). Intravenous fluids can also be administered to the affected dog to support their systems. How can we avoid blue-green algae poisoning? Some areas which are known to be affected will have sign-posting to avoid these areas out walking. If you see an area with this scummy appearance to it, be sure to prevent your dog swimming, paddling, or drinking anywhere near it. He may not seem to appreciate being put on a lead when he’s a keen swimmer, but believe us, he would be grateful if he knew! Bringing fresh water and a bowl for walks will limit your dog’s drive to drink from the dirty depths of the most rancid puddle in the park. Putting him on a lead to prevent him swimming in suspicious-looking or stagnant areas will also decrease the risk. It’s hard, but try to keep an eye on where Rover is roaming or Pluto is paddling if he is off the lead. Check potential swimming areas on your walk for depth and speed of water flow as a general safety measure (if you allow your dog to swim on walks), and at the same time, keep an eye out for blue-green algae! Who else can be affected by blue-green algae? You! Humans can have serious gastrointestinal upsets, as well as uncomfortable rashes. At worst, liver and even brain damage can occur. It is essential to avoid children being exposed to it. Cats. Cats can also be affected; it is harder to limit free-roaming cats’ exposure to the bacteria, unfortunately, but the good news is that they are usually less interested in smelly, scummy water than our pooches are. If you suspect an area to be affected by Blue-Green Algae, you should inform your local environmental agency, who can put up notices and mark the pond, pool or puddle as “out of bounds”. All of us wish you and your dogs (and cats!) happy, healthy walking and swimming!